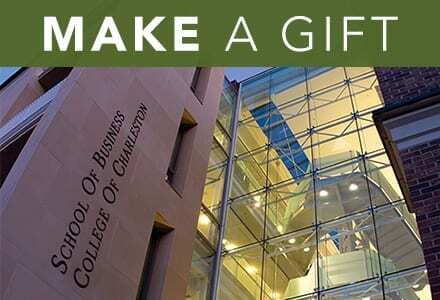 It pays to study real estate at the College of Charleston School of Business. High-performing students minoring in real estate are eligible for a $2,000 per year scholarship. A $250,000 gift by Ben and Tricia Carter will provide 40 new scholarships for undergraduate students who focus their studies on real estate. The Carter family established the Carter Real Estate Center in 2006 with an endowed gift. The scholarship announcement coincides with the cross-disciplinary real estate minor. Read more about the real estate minor. The real estate curriculum is built around the framework of the “commercial real estate system” which consists of three integrated markets and functions: real estate use markets, the real estate asset market, and the real estate development industry. To qualify for scholarships, students need to commit to the real estate minor or concentration. Beginning in January, scholarships will be competitively awarded to sophomores, juniors, and seniors based on students’ academic record and their demonstrated interest in the real estate industry. The scholarships are renewable until the sophomores and juniors graduate. Based on the award amount, the gift allows for scholarships to also be awarded to 10 students next year. In addition to the scholarships, the Carters also gave an additional $10,000 to create an annual, non-endowed recognition fund for two business student awards. The first award amount for $1,000 will be given to the real estate student who achieves the highest score on the ARGUS certification test. ARGUS Software, Inc. is considered the industry standard for analyzing an existing or potential real estate investment and its value and is used in School of Business classes. The second recognition award for $1,500 will be given to students who excel in the real estate market analysis course. For more information about the real estate minor, applied learning opportunities, and the real estate club, all College of Charleston students are encouraged to attend the Real Estate Kickoff Event on Thursday, September 5 at 7 p.m. in the School of Business Beatty Center, Wells Fargo Auditorium. For more information, contact Elaine Worzala, director of the Carter Real Estate Center, at worzalae@cofc.edu or 843.953.8121. College of Charleston’s School of Business offers seven undergraduate majors and several interdisciplinary concentrations, an honors program in business, an M.S. in Accountancy and an MBA. Approximately 1900 undergraduate and graduate students attend from as far away as China, Germany and Brazil. The faculty has research expertise in areas such as global logistics, hospitality and tourism, political economics, financial investment, bankruptcy, business intelligence, real estate, and sustainable business practices. Visit http://sb.cofc.edu/to learn more about our students’ achievements, undergraduate and graduate programs, faculty and Centers of Excellence. The Carter Real Estate Center (CREC) facilitates the teaching, research, and industry service by bringing together students, faculty and business community executives to better understand the complexities of commercial real estate assets and the changing dynamics within the industry today and to help prepare students for post-graduate job placements. The CREC was established and is supported with a generous gift from Ben Carter of Ben Carter Enterprises (Atlanta, GA), the Carter family, and other friends of the Center. Visit http://sb.cofc.edu/centers/carter/ for more information.